The Frac (Fonds régional d’art contemporain) are French regional centres of contemporary art. 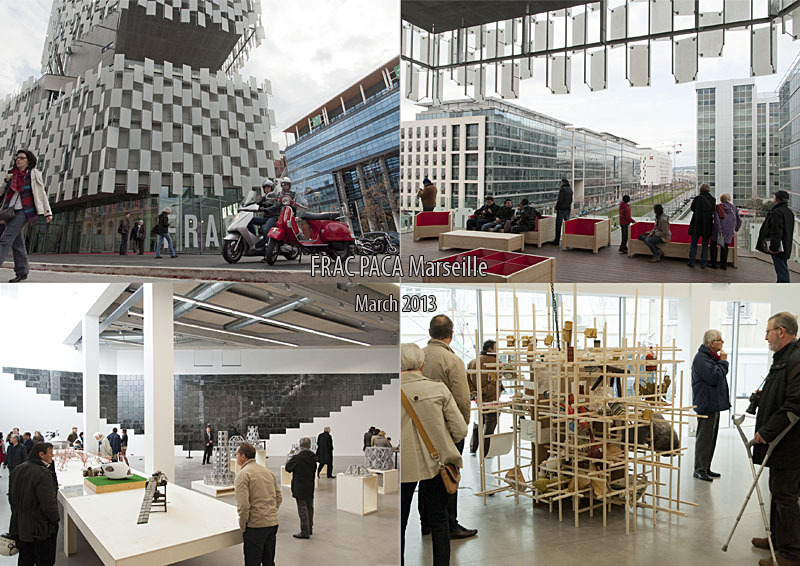 The Frac for the Paca (Provence-Alpes-Côte d’Azur) region has just re-opened in a building which has been refurbished under the supervision of the architect Kengo Kuma. Amongst a boulevard of commercial buildings, he has used glass tiles set at non-square angles to establish the difference of the Frac building. From right below it looks like the building has jaws, ready to snaffle up anything offered to its clutches... Inside, lots of white and grey, which colours the visitors echo with most visitors wearing black or cream! M. C. Escher’s ants in an infinite loop, impossible staircases and tricks of perspective are the images that come to mind with the mention of the Dutch graphic artist’s name. 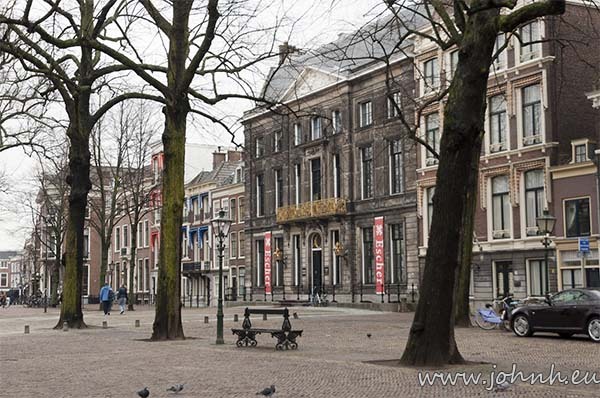 A museum is established in his honour in Den Haag in the former Winter Palace of Queen Mother Emma of the Netherlands. Their collection includes prints of his famous images exhibited alongside representative images from throughout his career. The top floor is given over to rooms demonstrating illusions of perspective and vision - a potential kiddie-hell-hole, though me and my big-kid friend Wolf found it fun too. The National Maritime Museum is not the obvious venue for a major exhibition of this seminal photographer of American landscapes. This exhibition features more than a hundred original Ansel Adams prints, including three of the wall-sized prints which were produced for the American Trust Company Building in San Francisco. 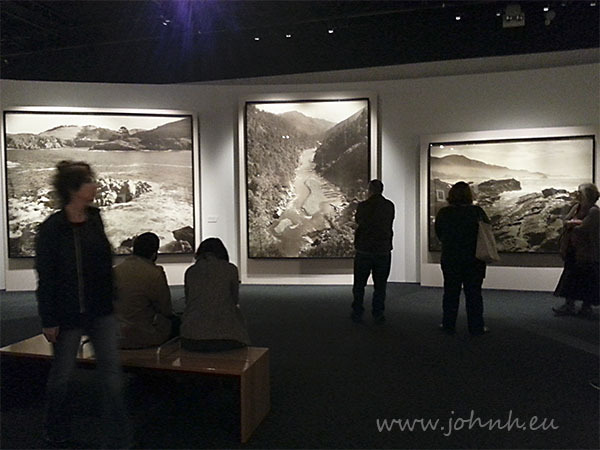 These three alone justify a visit to the exhibition, add the opportunity to see the detailed and dynamic original prints of some familiar images of Yosemite and this exhibition becomes a must-see despite the disappointment that it is not displayed in an "Art" venue. A very pleasant and sunny afternoon walking in Brighton seeing various artists’ work. The Artists Open Houses (AOH) event has been going for thirty years or so as a semi-official part of the Brighton Festival. There’s a well-produced guide of 96 pages plus several individual walking routes and maps. It’s a great tradition, an opportunity to meet with the artists and to see their work displayed in informal domestic surroundings; many of the houses were also offering tea and homemade cakes in the charming gardens of the Victorian houses. There’s a wide variety of types of art and craft on show, the artists have themselves developed in different ways, some are independent whilst others have aligned with various groups and co-operatives. Some are glorious amateurs others are professional. And of course it is an opportunity to buy their work. Billed as The biggest Bauhaus exhibition in the UK in over 40 years, the Barbican Art gallery’s Bauhaus exhibition features a wide range of artefacts from UK, Berlin, New York, San Francisco and Paris. Not only are there works of the Masters (ie teachers) of the Bauhaus school and the students, there are also posters, photographs and printed materials illustrating life in the Bauhaus school. At last a decent Bauhaus exhibition here in London but it’s a very British selection with few translations for non-German speakers and no “Continental” perspective. I am surprised that London and Britain have ignored Weimar culture and its apogee, the Bauhaus school of art and design, over the past few decades. Their pre-WWII art and design was far in advance of British attempts: Arts and Crafts was a pale and diffuse light compared to the strong clear light of Bauhaus Weimar and Bauhaus Dessau, whose influence has proved enduring.